9132 Fine Riley Whiting, Winchester, Conn.
painted tallcase clock circa 1830. 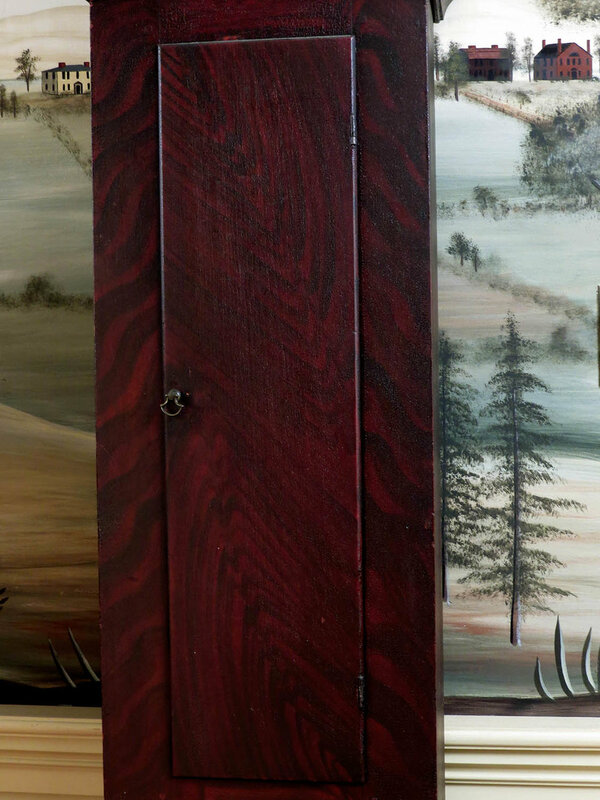 This clock has an exceptionally good case with the original grain painting. It has bold black and red colors plus contrasting birds-eye maple columns and top crest. It has the original finish which has darkened and I am sure the case has not been cleaned in many years. If that were done, I think the colors would be much more pronounced. The case has never been altered and the feet or crest have never been trimmed. The dial is in especially good condition. The signature is bold against a gilded background, the colorful corner spandrels show no loss to the paint or gilding, all the numerals are virtually perfect and bright and there is a painted pineapple in the center symbolizing hospitality. The clock retains the original pewter hands, weights, counterweights, pendulum and door glass. I checked the wood movement over fairly carefully and it seems to be in much better than average condition. I did not see any replaced or repaired teeth or pinions in the gearing but there are some chipped ratchet teeth on the time side winding drum. It has new weight winding cords but the movement has not been cleaned in quite some time. The condition of the case, dial and movement indicates to me that this clock was not handled, moved or even run very often. To add a bit to the clock’s history, the back of the dial has several service notations in pencil going back to 1859. This is a 30-hour wood movement clock that strikes each hour on a bell. 9133 Riley Whiting / Rufus Cole wooden works tallcase clock circa 1830. 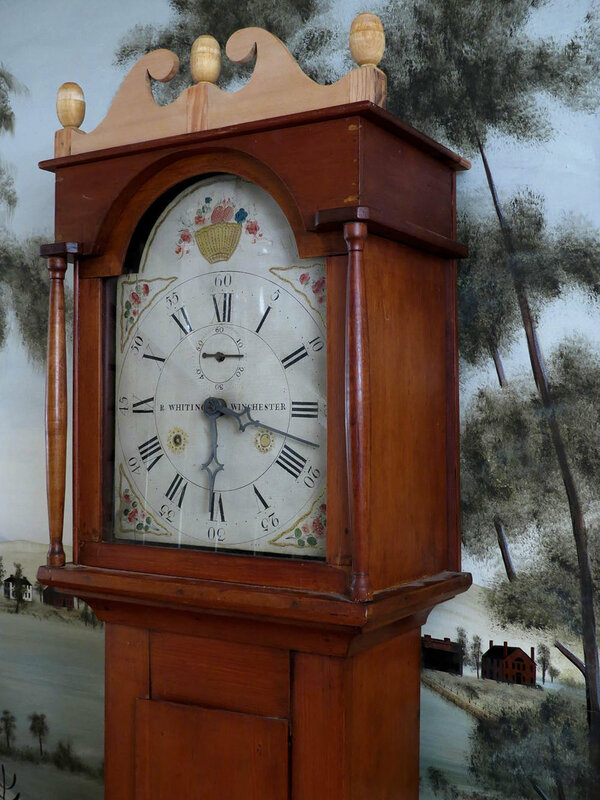 Rufus Cole of Broadalbin, N.Y. is very well known for producing some of the finest grain painted tallclock cases that can be found. Beyond the fabulous grain painting itself, his clocks are known for the inclusion of folk art stenciling containing top hats, leaping deer etc. Google him and you will see what I mean. I have included one photo of an example of another Cole clock that had the paint redone. Rufus Cole and his father Abraham made their own clock cases and decorated them. These cases all have a very distinctive construction style of the hoods and are easily recognized. This is one of their cases but unfortunately that grain painting has been stripped away, probably during the furniture refinishing craze of the 1960s. Perhaps you can find someone to restore the decoration or simply use it as it is. The very top scrollwork and finials were missing and those have been remade in the correct style. They need to be colored to match the rest of the case. Cole very often used movements by Riley Whiting of Winchester, Conn. and that is the case here. The painted wood dial is in excellent condition without any loss to the numerals, gilding or painted areas. All indications are that this is the original movement and dial for this case. The clock comes with the original weights and pewter hands. The wooden cap on one of the weights needs to be repaired. The pendulum bob is a replacement. This is a 30-hour wooden works clock with hourly strike on a bell. The movement needs repair to the ratchet teeth on the time winding drum, there is one broken pinion leaf and it needs new weight cords. At just under 7 feet tall, this clock will fit easily into any room. $950. Though not particularly rare, these provide a great antique clock value because they are eight-day, brass movement, pendulum clocks and they are very dependable. This clock has a nicely refinished solid cherry case with a walnut stain. There are no case problems or damages and it has the original glass in the door to view the pendulum. The only issue is that the brass finials have become bent. It has the original signed dial paper plus the original hands and polished brass pendulum bob. This is an eight-day brass movement clock, spring driven, with an hourly strike on a gong. I bought it from a family who had not had the clock serviced in many years however it is running fine and keeping good time. 9137 Rare James Woolley, Codnor, tallcase clock. James Woolley was born in 1695 and died in 1786. His nephew John Woolley was another of this famous clockmaking family. Codnor is in the north of England in Derbyshire, near the Nottingham border. Close to the Peak District for those of you who have traveled there. According to a clock collecting friend of mine in Derbyshire, Woolley was a bit of a character and regionally well-known – making mainly longcase clocks for over 50 years ( 1715-70). He had a local reputation as a miser but was a very good self-marketer; claiming that his clocks were “superior”. To his credit, those movements are actually quite good. He made a clock for free for the Nottingham Town Hall as a marketing gesture and the city then granted him the Trade Guild freedom to sell clocks into that city. This clock has a solid oak case in an old finish. The base has chamfered corners, the waist has quarter columns and the hood has full columns. Style and dial features date this clock to about 1760. The brass dial is signed “Woolley, Codnor”. It has an applied silvered chapter ring marked out in intervals of quarter hours on the inner portion of the ring for a clock with a single hour hand. The outer ring is marked in minutes for a clock like this one with a minute hand, indicating the clock was made during the transition period from single hand clocks. The center of the dial is nicely engraved and there is a separate calendar dial plus cast brass spandrels. I do not see any damages or losses to those spandrels. The hands have been replaced while I believe the pendulum and the weight are original. This is a one-day clock with hourly strike on a bell. It is a chain pull up style with the time and strike operating from one weight. It has been running well for me. 6 feet 6 inches tall. $1,950.